The iris is one of the most interesting and unique aspects of a person. We can be mesmerized by the beauty and attraction of one’s eyes, primarily due to the iris or that special “twinkle”. This uniqueness even translates as a security feature on electronics, similar to a fingerprint. However, there is a real biological purpose for the iris. What is the purpose of the iris? 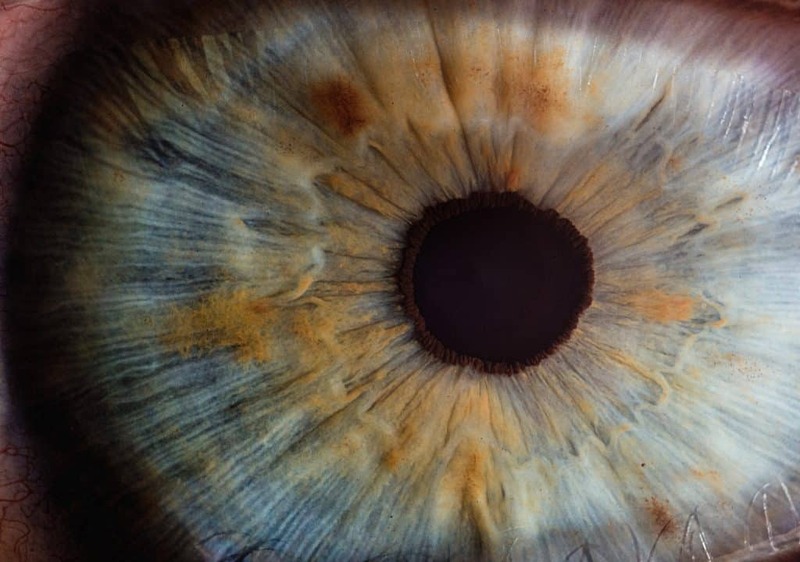 The iris controls the size of the pupil, which then determines the amount of light that enters the eye. When in a dark or dim environment, the iris muscles constrict, and the pupil enlarges (or dilates). This allows more light to enter into the eye. If the setting is bright, the iris width increases, which makes the pupil smaller. Therefore, the iris blocks additional light from entering the eye in bright lighting conditions. People with light-colored eyes may be more light sensitive compared to those with dark eyes. The iris pigment (melanin) helps block additional light in bright environments. With blue or green eyes, there is not a substantial amount of melanin to stop light from entering in the eyes. On the other hand, the dark pigment in brown eyes acts as natural sun protection in a way. Having brown eyes is by no means a substitute for wearing sunglasses, but it does help decrease the amount of harmful UV light that can lead to macular degeneration. 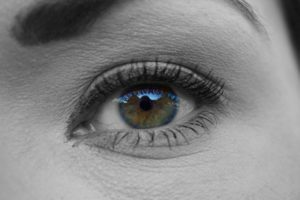 For this reason, it is no surprise that people with blue eyes are more likely to develop macular degeneration. shock two blue-eyed parents with a brown-eyed baby, although rare. Brown is the most common iris color worldwide and is genetically dominant to all other iris colors. Green is the rarest eye color in less than 5% of the world population. Although there are countless color combinations, the main color groups are classified as brown, blue, gray, hazel, green, and amber. The color of the iris is based on the amount of pigment, or melanin, present throughout the different layers of the iris. The more pigment present, the darker the eyes. The less pigment present, the lighter the eyes. Under high magnification, brown iris strands look like thick ropes, whereas light iris strands look more like wispy fibers from a sweater. Heterochromia is when an individual has two different color irises (ie. one blue iris and one brown iris). This can be genetic, or caused by a problem during development, ocular disease, or injury. 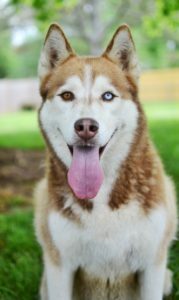 Animals can have heterochromia too! When does eye color develop? When a baby is born, the eye color may or may not reflect the eye color that will later develop. Babies with dark skin already have melanin that can make the iris appear brown in color. 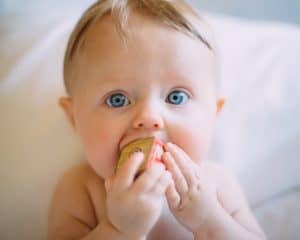 On the other hand, babies with light skin are born with a very small amount of pigment, which makes the iris appear gray or light blue. Around 6 months after birth, iris pigmentation begins to darken as the amount of melanin increases. By 6 to 9 months of age, the iris color will reveal itself – blue, green, hazel, etc. Babies born with ocular albinism develop much less melanin, which can make the iris appear red or pink. The iris fibers are not truly red though. Since the iris does not have a significant amount of pigment, the light that enters the eye bounces and reflects off the red blood vessels and retina within the eye. This gives the appearance of a red-tinted iris. Can iris color change throughout life? Eye color can be affected later in life from trauma or ocular disease. When the color of only one eye changes (heterochromia), it can be a warning sign of a serious eye disease such as Fuchs heterochromic iridocyclitis, Horner’s syndrome, or even uncontrolled diabetes. Either the entire iris or just a segment can be altered with these conditions. Because the iris contains pigment, freckles can develop just as they would on the skin. Most dark spots on the iris are longstanding freckles that stay the same over time. Like a freckle on the skin, it is rarely suspicious for malignancy unless it increases in size, elevation, or pigmentation. If these indicators are present, there may be further complications that require urgent attention. Regular eye exams can help detect changes and ensure the proper treatment is in place if necessary. Can I change my iris color? Colored contacts are an option to temporarily change the iris color. There are many different shades to choose from! It can be challenging to make brown eyes appear blue, but there are shining enhancement options to make brown eyes sparkle even more than usual. Different shades of makeup, hair color, and clothing can also affect what color the iris appears at the time. Although there are countless gimmicks about “special eye drops” and surgeries that can change the color of the eyes, there is no safe way to completely switch the color of the iris. These ploys are just eye infections waiting to happen! I LOVE THE COLOR OF MY EYES! If you’re proud of your beautiful iris color, be sure to include the anti-glare (AKA anti-reflective) treatment on your glasses. The anti-glare treatment blocks additional light reflections from the lenses, which makes the plastic appear clearer. So rather than seeing bright streaks of light on your glasses in a picture, your eyes will steal the show!